The other day, my husband made an amazing butternut cream sauce. He had plans to use it in this butternut pasta casserole. This dish is perfect comfort food that just so happens to be vegan and gluten free! It was a super cinch to make too. 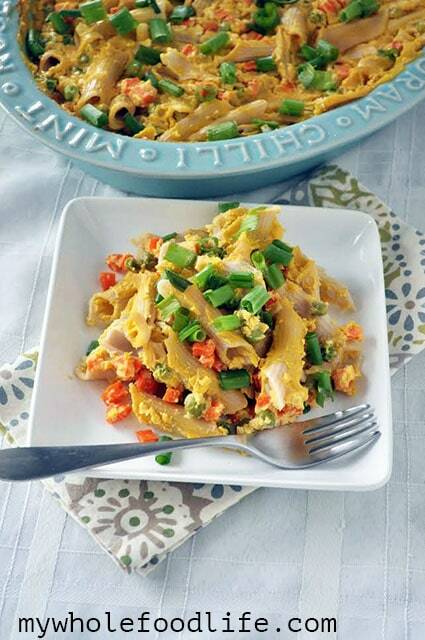 This butternut pasta casserole would make a great main dish for a plant based Thanksgiving. I also think the veggies can we swapped out for whatever you have on hand. We just happened to have peas and carrots, so that is what we used. If you are looking for more plant based Thanksgiving ideas, you can check out this post. We actually made the sauce the day before the casserole, so you can do that if you want to save time. This should last 5 days in the fridge. I haven’t tried freezing it, but I imagine it might freeze well too. The perfect dish for a plant based Thanksgiving! Cook pasta al dente (about 5 minutes) and remove from water and put in a casserole dish . Mix in peas, onions, and carrots. Cover the dish and cook at 350 for 40 minutes. IM EXCITED TO TRY THIS FOR MY FIRST PALEO THANKSGIVING. CAN YOU TELL ME HOWEVER, WHAT I MIGHT BE ABLE TO USE IN PLACE OF THE BREAD CRUMBS FOR A TOPPING? AND IF I OMIT THE PEAS WILL IT CHANGE THE TASTE OF THE CASSEROLE MUCH? You may be able to use quinoa flakes in place of breadcrumbs. You can use another veggie in place of the peas. This was AMAZING! Kid approved and not too labor intensive. We are not vegan so I subbed the nutritional yeast with parm cheese. (Never quite got used to that flavor) DELICIOUS!! I love how we're 'allowed' to use whatever veggies we have in!! (although actually that's peas and carrots for me too :P ) I'm also super excited about the addition of the green onion. I wouldn't have thought to add them - but now I've seen them I can't wait to try it! Panko bread crumbs have dairy in them....sadly. But I'd substitute another topping, this sounds really delicious.